For dinner last night, roasted potatoes was on the menu. I have a tough time when it comes to cooking with potatoes for my family. Not that I cannot make decent potato curry, but rather that my mother-in-law makes the best potato fry or curry ever. I don't know how she creates such perfectly roasted potatoes, without much oil. She does not use the oven or microwave, but each potato piece will be uniformly roasted. A technique and skill I would like to master. She has set such a standard that its kind of challenging to meet. 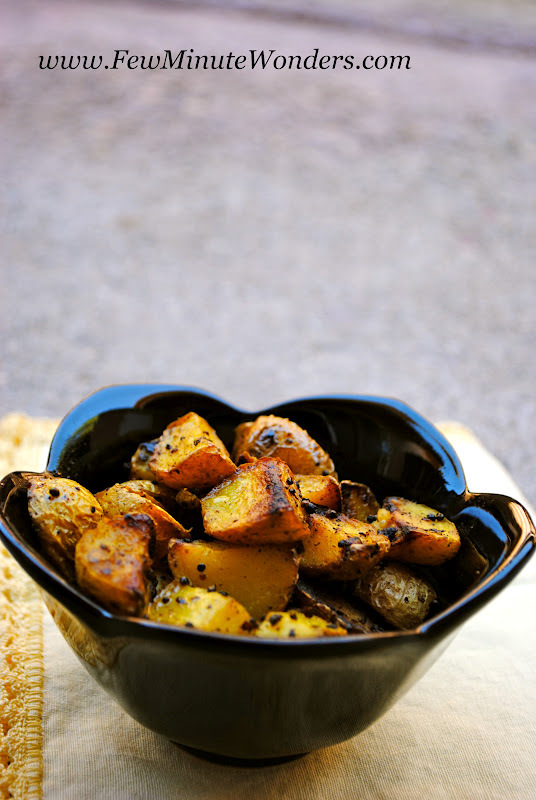 This is my version of roasting small potatoes with skin. The photos are a part of my photo exercise for an event hosted by Aparna: Less is more. 1. Heat the kadai over medium heat but below medium high. 2. 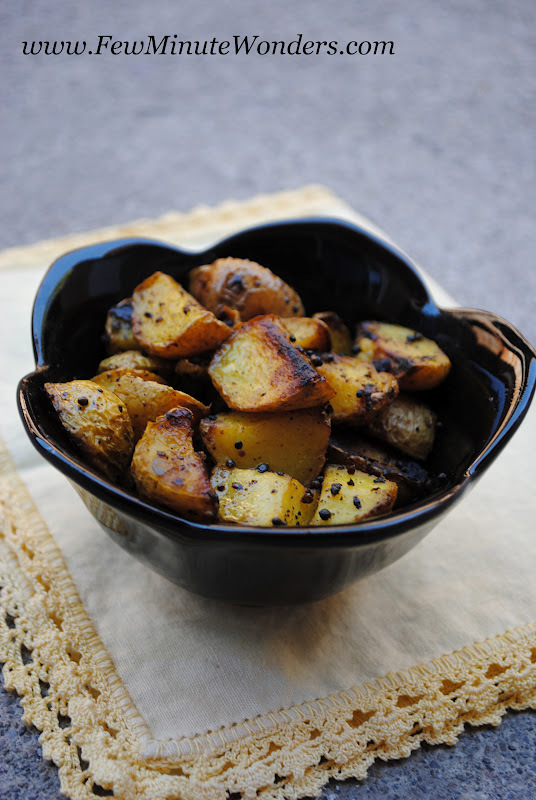 Cut small potatoes into 4 pieces, add 1 tbsp of oil, turmeric and chilli powder, salt and mix it well. 3. Add 1 tbsp of oil to the kadai allow it to warm up. Add mustard seeds, asafetida and allow for the seeds to pop. Add the potatoes and mix well once. Cover the kadai with a lid and allow it to get toasted for 3 minutes. 4. Keep mixing every 2 minutes but remember to keep the kadai covered otherwise. 5. It would be about perfectly roasted in 15 - 20 minutes. Ohh it cooked on stove top but it really look like oven roasted potatoes...simple yet delicious potatoes,come out crisp...pics are too tempting!! Thank you Sowmya, It is not easy, this potato turned out fine. I think its to do with the temperature, keeping the potatoes covered and mixing all the spices before cooking the potatoes. This works for me. Thanks for joining us this month, Srimathi. I liked your 2nd photograph where your angle is nicely showing the potatoes as well as the edge of the bowl. lovely and crisp..looking at them I thought they are baked in oven.lovely clicks! Potatoes are always inviting, this one looks very tempting..
Arent the pieces big ? how will it work if we cut it smaller ? what potatoes did u use ? Salivating here,so tempting and droolworthy potatoes, simply inviting. Thank you all. Sowmya, The potatoes were a bag of small potatoes, red and yellow. I cut each potato into quarters and then roasted it. Oh yum yum!! Love a nice crispy aloo!! Lovely roast! And pic is composed so well, truly less is more. Awesome and tempting potatoes. Yummy. Roasted potatoes are always the way to go for me! These look fantastic.